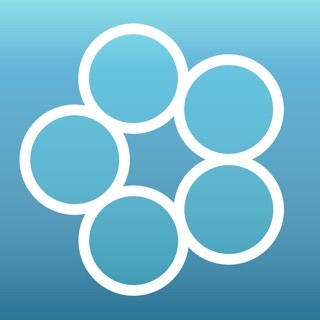 Carat 2.01 can also show App Recommendations on iOS 9.0 through 9.3.2! Our next release will include settings recommendations for iOS 9.3.3+. We are already collecting the data for this, so stay tuned! 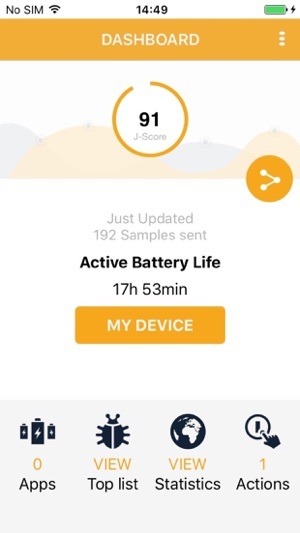 Carat is the first app to generate personalized recommendations for improving your battery life. 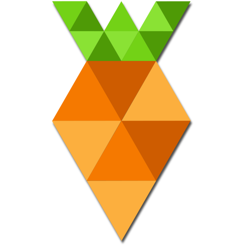 After observing your use of the device for *a week or more*, it will start to generate reports just for you. You should open the app once every day or so, with an Internet connection turned on, until you start seeing results. 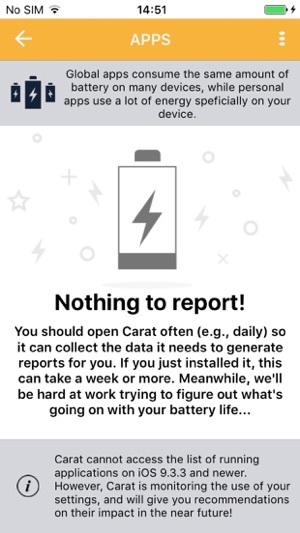 Although Carat uses Location Services (thus displaying the little icon), it is NOT using your GPS and is NOT running in the background. The app uses almost no power. 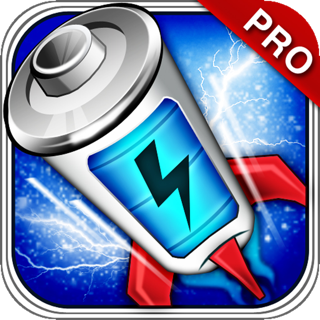 Ever wondered why your battery is draining so quickly? 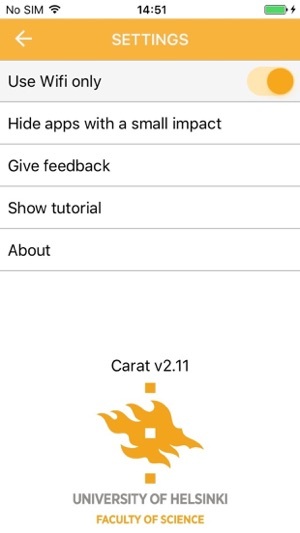 Just install Carat, open it every few days with an Internet connection turned on so it can send data to our servers, and within a week Carat will start recommending Actions (just for you!) and even predicting the improvements you will see. Although Carat cannot measure energy use directly, it infers what apps are responsible using advanced machine learning methods. 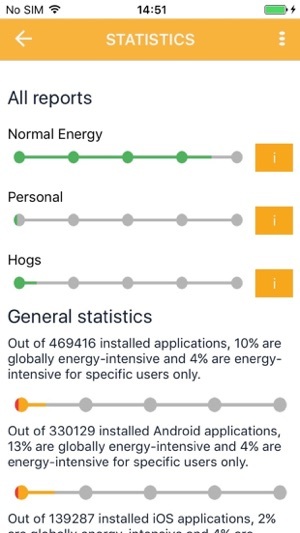 Carat will tell you which apps generally use a lot of energy and and those that specifically do so on your device (but not on most others). 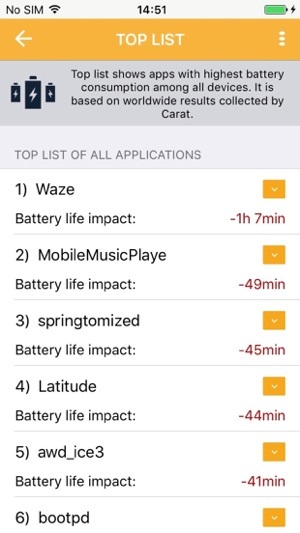 This does not make an app 'bad', but this advice can help a user improve their battery life. 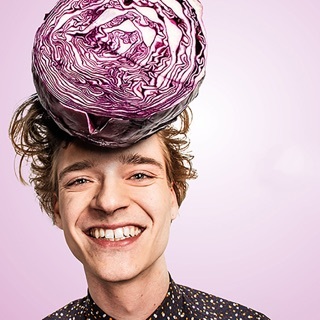 Carat is under active development by a team of researchers in University of Helsinki. We are constantly making improvements, adding features, and giving you more knowledge about how your device is using energy. Remember, knowledge is power! Fix display of model name for newer iPhones. Get model names from server-side. De arra alkalmas, hogy osszehasonlitsd mas Carat-ot futtato userekkel a akksid teljesitmenyet. Az elso meres (3 nap 7 ora keszenlet, 10 ora 31 perc hasznalat utan) nekem 95 pont lett ami szerintem tobb mint jo. On my iPhone4 there's iOS7.1.2 running! Carat quits immediately after launch! I tried several times with no effect.